If you just want the code you can find it on github. Creating a compliant DC motor or compliant motion controller could mean many things depending on what the application scenario is. In this case I would like an electric motor driven mechanism to resist having it's position disturbed but also to accept a new position if it is pushed and held in place (i.e. over-riding the holding force of the motor). I'd also like to be able to set the resistance digitally (from code) so that at different times the motor has different strengths of resistance. Finally I'd also like to be able to digitally command (from code) a new position, despite what is happening through physical interaction, and whether or not the motor moves depends on the strength setting of the motor. These things together might seem like a bit of a contradiction. However imagine a mechanism that has to move through many set positions as part of an animation sequence. This mechanism will also be exposed to the public, so you might want to have the mechanism soft enough to prevent a finger being trapped, or you might want the mechanism to be pushed and pulled around interactively without causing any damage to the equipment. This kind of physical interaction could also be useful for a more complex robot experience with people. In fact, this kind of compliant motion control is the future for safe human-robot interaction. Book Hive Teaser Trailer from Adam DJ Laity on Vimeo. In this post I document my first attempt at creating a low-cost compliant motion controller. I've made it as simple as possible and as well commented as possible. 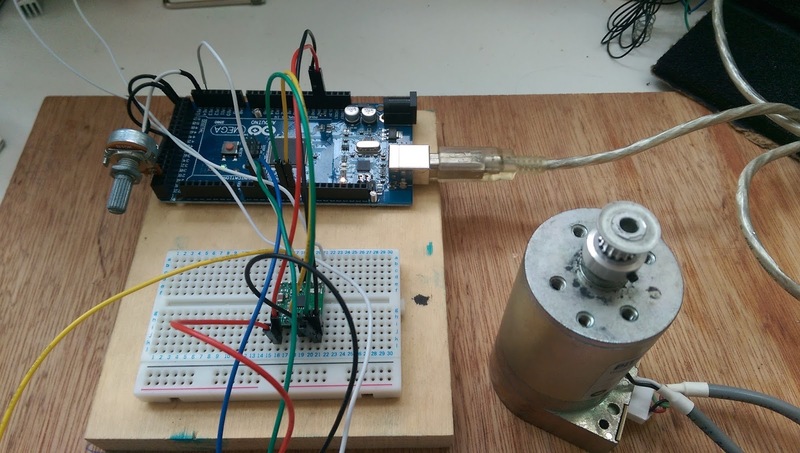 An Arduino or similar to read sensors and send movement commands. A position encoder, the motor I am using has an integrated optical encoder with 1000 clicks per revolution. The code is written for a quadrature encoder. This one is good. A DC motor controller, I'm using a DRV8801 from Polulu. A potentiometer to provide some external input to the system. A 12V power supply for your motor, I'm using a lab power pack with 2 amps of current available. A computer to do some coding. In my setup I've connected DIR to pin 7 and PWM to pin 6. I've also connected a potentiometer across Analog 14, Ground and Pin 53 (set high). If you want to use the example code without modification you'll have to do the same. I've also wired the quadrature encoder data into pins 2 and 3 - you may need to reverse these or your motor polarity. Motor position: This is read from the rotary encoder and should be quite a reliable indication of where the motor actually is in reality. Desired position: This is a position set in software, which is relative to the units read from the encoder. PID Algorithm: This is algorithm takes both the Motor Position and Desired Position and creates an error signal, which describes whether the motor should rotate clockwise or anti-clockwise and with how much magnitude in order to gain the desired position. Error Signal: As above, but note that the same value is fed into the Position Controller and the Backdrive Monitor. Position Controller: This element takes the Error Signal and decides how to operate the motor. There are two important characteristics. First the direction, set through Pin 7, and this corresponds to whether the Error Signal is positive or negative. The DRV8801 needs a high or low signal to determine direction, . Second, the power of the response, which is taken as the magnitude of the error and sent out of Pin 6 as a PWM signal. Using these two things combined, the motor should move toward the Desired Position if it is away from it. When the Error Signal is zero, the PWM signal will also be zero, and so there should be no movement from the motor. Backdrive Monitor: This is the crucial element for providing the motion compliance. Without it we have just a standard motor controller that will fight to keep the desired position. The Backdrive Monitor therefore watches the Error Signal for the sign that the motor is being held against moving toward the desired position. If the motor is being held away from the desired position, then the Backdrive Monitor adjusts the Desired Position to reflect this. This has the knock-on effect of changing the output of the PID Algorithm - the Error Signal - which changes the Position Controller and also itself, the Backdrive Monitor. The result is that if the motor is held away from the Desired Position and is held steady, the resistance will be slowly reduced and the motor will 'relax' into it's new physically set position. Position Sequence Controller: This last component simply sets a new desired position, and in this example we will use a pentiometer to set this externally and test the performance. In application, this might be a series of positions in an animation or a signal from a more complex behavioural controller. In this example, the Position Sequence Controller is very simple, and could do with more advanced features (discussed later). The Backdrive monitor needs more explanation. The Backdrive Monitor watches the Error Signal over a period of time for the sign that the motor is being held against moving toward the Desired Position. This is achieved by storing the Error Signal values across a period of time, and then looking at how much variation there is across the whole set. If the Error Signal values are all different, then the motor is either moving by itself to a new position, or it is being moved (moving) externally. If the error values are all the same, then we can assume that the motor has been moved to a new position and is being held there, or it has met an obstruction and can't move. The desired result is that if the motor is held away from the Desired Position and is held steady, the resistance of the motor will be gradually reduced and the motor will 'relax' into it's new physically set position. If the microcontroller is fast enough, this realisation of movement can happen very fast, and so the compliance of the motion can feel very natural (not stuttered) whilst simultaneously offering some resistance. This observation of variance in the Error Signal is nicely achieved with Standard Deviation. Standard Deviation gives a value from 0 upward to quantify the variance in a set of numbers. Therefore, Even if the Error Signal values from the PID algorithm are arbitrary non-zero values and signed (e.g. +22, or -31), if the values are consistent the standard deviation will be closer to 0. This consistent measure of variance from 0 upward is useful. It will allow us to observe the characteristic of change over time. Using Standard Deviation we can decide the likelihood of the motor being held, and also use it to ignore any jitter in the motor movement which will also cause the encoder value to jump around. Jitter would occur if the motor is trying to move but not succeeding, and it makes it hard to tell if the motor is being held still. Jitter can be removed by thresholding the returned Standard Deviation (SD) value. That means we set a value to check the SD against, and use this to decide the correct course of action. For instance, if we passed our compliance check only on a SD value of 0, the motor would need to be held exactly in the same position for a period of time (i.e., stored Error Signal values all identical). If we passed on an SD value of 1 or less, we could ignore a small amount of movement (less than 1). If we passed on an SD value of 10 or less, the motor can be held quite roughly in the same position, and the compliance will kick in. Of course, these values are dependent on what types of values your encoder returns and any jitter from your motor fighting against the held position. 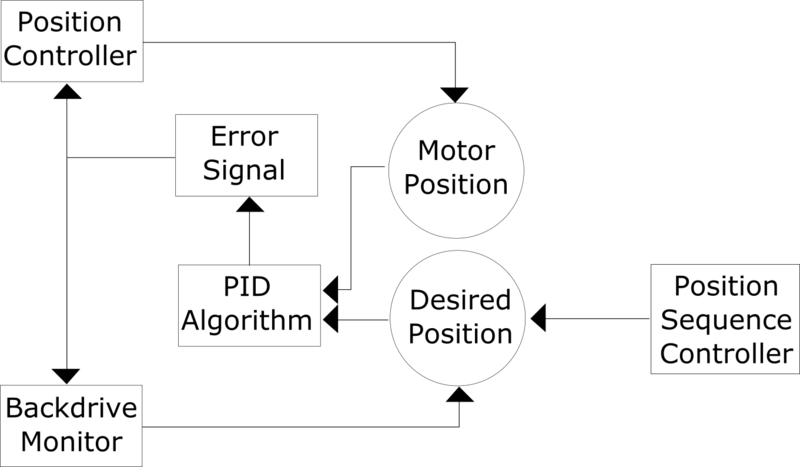 This motor jitter is partly defined by the PID algorithm and the position controller. You can probably see that through all of this there are quite a few variables that will need to be tuned to your specific system and applications. You might be asking, what units are these values all in? Quite bluntly, most of it is arbitrary. The encoder count can be converted into an angle, but it is not necessarily useful to do so, and it will consume computing time. Any definition of angle will be chewed up by the PID algorithm and converted into an Error Signal that cannot be directly sent to he motor controller. So in reality, a PID system will always need to be tuned, and this is best done with a physical system and through iterative testing. Units of measurement are not especially useful in a system like this. Hopefully you will discover that tuning the system is not too tricky, and it is actually quite fun to see how it responds and what the limits are. I've put loads of comments in code to try to make it as understandable as possible. You can also find this on github. // Encoder Variables. Note volatile, an interupt changes them. // in this example set from a potentiometer. // when the motor is held in a position. // to a known value anyway. // as if it were part of a movement instruction. // Take an initial time stamp. // Show a reset so we know when something has gone wrong. // blog post. See functions for comments. // based on the error value. // you wire your DC motor. // Set power based on error. // of the error not the sign (+/-). // power does not map linearly to 0:255 range. // motor you should to tweak the kp,ki and kd variables. // encoderPos is global and altered via interupt. // make the compliance more responsive. // though the error value itself may be non-zero. // match the new position. // makes a smooth transition. // value on the POT to set a new sequence position. // Read in a target position set by the potentiometer. // moved to a new position. // from the pot reading. // Very simple PID routine. // Registers the time it was called. // Set global kp,ki and kd variables. // Tune these based on observed performance. // Interupt based encoder update. // You'll need to adjust this depending on your arduino device. The PID routine would be better if it ran reliably on a timer interrupt routine. The backdrive monitor currently adjusts the Desired Position (pid_setpoint) using the easing technique. This could itself be replaced with a PID algorithm to provide a more resilient or characterful response to the motor being backdriven. The Position Controller simply maps the PID error signal to the range 0:255. In order to compensate for gravity or an unbalanced load, this mapping would need to be biased depending on the direction (sign) of the error. In this example, the motor power is mapped from the error signal, which means that the resistance the motor offers increases as the motor is moved away from the setpoint (desired position). To improve this, the DRV8801 provides an analogue output signal that indicates the current draw of the motor. To provide a constant resistance, the output power could be limited by a reading the current consumption of the motor.